Mass balance is in many ways piratical by nature. There is a reason why a JIRPer often stumbles across pirate flags with the words "Mass Balance 2012" scrawled onto the walls of camp. We have our map, shovels to dig for treasure, and X marks the spot. However, our modern day plundering involves a somewhat different set of tools, and an altogether different goal. In lieu of a pirate ship, we ride our skis into the horizon, following a GPS in search of science. The mass-balance crew on the morning before skiing to the Demorest Glacier pit. Photo by Mary Gianotti. Although I have lost touch with the outside world, I am told that the day we left C-10 was July the 26th, bound for C-9, tasked with digging mass-balance pits on the Matthes and Demorest glaciers. For all you glacial neophytes out there mass balance is the bread and butter of JIRP science. By digging a pit into the winter snowfall and comparing to the summer ablation (mass lost through melt, sublimation, calving, etc.) we can determine whether the glacier has gained or lost mass over the year, and learn about the variability of the glacier on an annual basis. JIRP holds one of the longest records of glacial mass balance data - having measured Taku Glacier mass balance every year since 1946. Storglacieren in Sweden is the only glacier with a similarly long data set. Our itinerary was a nine-mile ski to C-9, pausing to dig a pit just short of camp on the Matthes Glacier. We would spend the night in camp, and then ski down onto the upper Demorest Glacier to dig another test pit before returning to C-9 for the night. On our final day we were bound for C-18 and the wonders of the Vaughn Lewis Icefall and Gilkey Trench. We waved our final goodbyes to C-10, made a final pit-stop into Dreamland, and then took off down the ski hill onto the vast expanses of the Taku. We skied up-glacier on snowmobile tracks laid down by Scott McGee and the survey team, taking a few short snack breaks along the way, eventually hanging a right up the Matthes Glacier towards C-9. The turn onto the Matthes meant that we were officially on ground that none of us – save for our friendly field staff members Annie Boucher and Matt Pickart – had ever tread upon before - uncharted territory. As we set a course for discovery, I couldn’t help but smile. The interface between the Taku and the Matthes is quite noticeable; as the Matthes spills out into the Taku the flow rates vary greatly, producing a crevasse ridden terrain. These are mostly ankle-biters and nothing to really worry about, mostly affecting scientific curiosity instead of trepidation or thoughts of roping up. Mary Giannotti and Jon Doty relaxing while Matt Pickart and Chrissy McCabe dig. Photo by Annie Cantrell. After about four or five hours of skiing through marginal weather, we reached the pit location, and began digging. We dig our mass balance pits in four steps, each reaching progressively deeper down through the snowpack. The north facing wall is a clean wall, where we make measurements of density, and is never stepped upon as it would affect the snow density below. At first everyone is at work shoveling out the initial meter of depth, but once the first step becomes defined, only one person can safely fit on each step. At that point, those inside of the pit begin to shovel from their step onto step one, from where it is a shorter shovel throw to remove the snow from the pit. Those who are not within the mass-balance pit take a break and refuel for their next shift inside, or tend the rim of the pit to prevent snow buildup. This year our pits have averaged 3.5 to 4 meters deep, which takes about 4 hours to dig – in the past, however, pits have ranged up to 8 meters in depth, requiring feats of strength that even the Dread Pirate Roberts would shy away from. The treasure at the bottom of the pit? The annual layer. This line marks the boundary between this year and last year’s snowfall. It can be represented by a variety of features within the snowpack: an undulating ice layer - evidence of suncups from the previous year; a dirty layer – dust and debris upon the snowpack deposited throughout the summer and buried during the accumulation season; or depth hoar – large unconsolidated sugary snow crystals which sits upon the far more dense firn (year-old snow). Once we have found the annual layer we begin to take our data from the pit. We prep the wall of step four (the deepest) into a clean vertical face, and sample the snow at 10 cm (~4”) intervals using a coring device of known volume. Measuring the mass of these snow samples (and the thickness of all ice lenses that cut across our sampling section) gives us a density profile of the snowpack. 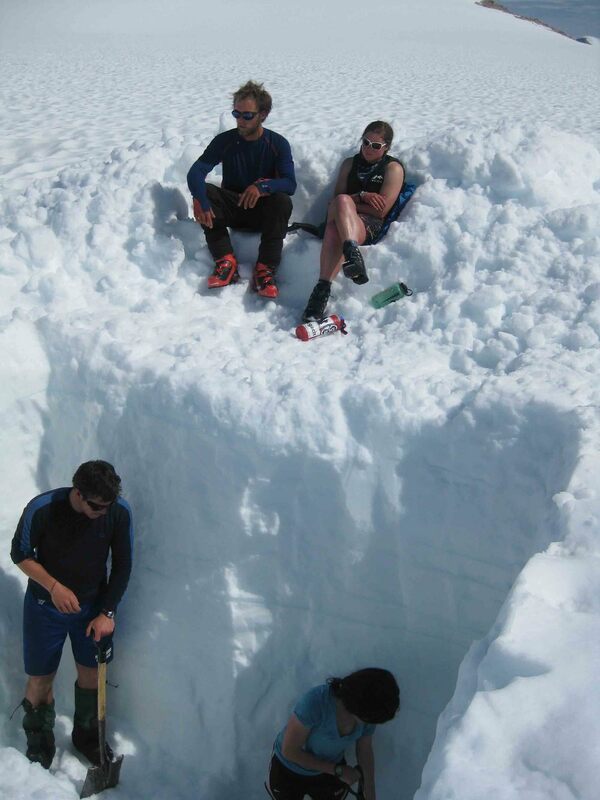 With this knowledge, we can determine the water equivalent of the accumulated snow at this location on the glacier. By digging pits at varying elevations and distances along the central profile of the glacier, we can estimate the total accumulation received by the glacier for the past year. Our pit on the Matthes ended up being 4 meters deep. The depth of our pits creates an interesting logistical problem: how to sample snow cores and ice lenses at fifteen plus feet off the ground. We JIRPers take this as an opportunity to cross the disciplines of science and mountaineering, and so we build a snow anchor and collect data on rappel. In this metaphorical crow’s nest (I know, this likeness is a bit of a stretch) we have a bird’s eye view of the pit we have dug, and can sample the layers safely and precisely. Hungry from a full day’s work, we chugged on up the hill to C-9 through a whiteout, gaining the first views of our home for the next few days only once we were within thirty feet. We all piled inside, leaving our backpacks covered up outside on the nunatak as there was no room indoors for anything more than people. C-9 consists of a single two story building with exactly enough space for about two fewer people than we had in our crew. We managed to squeeze in, and bided our time reading graffiti on the wall and cracking jokes while we waited for the pasta water to boil. After dinner there was only one option: bed. Interior of Camp 9 with Matt Pickart. Photo by Annie Cantrell. Dawn broke with a cloudless sky, and an absolutely beautiful view. After finishing off leftovers from last night we were treated to fresh oatmeal! Our ski down to the pit on the Demorest Glacier was an absolute treat – views of Devil's Paw, the Dipyramid, the Citadel, hanging glaciers, bergshrunds, and so much more. The first half of the ski was a long downhill, and so I sat back and paid zero attention to the track ahead of me as I soaked in the alpine panorama. Once we hit the Demorest Glacier we skied a few more miles of flats to reach the test pit. The sun was hot and bright, and so we blasted some music and got to work. The day was pleasant and the pit went quickly, and as manpower became less necessary within the pit we dug couches into the snow, and laid our socks on our ski poles to dry. Our pit ended up 4.5 meters deep, and so we cored it, and set sail back to C-9, treated to an absolutely incredible sunset just as we topped the camp ridge. Our rations for the night consisted of spaghetti with a mixture of tomato sauce, leftover broccoli cheddar soup, and roast beef for toppings. As we tucked in to bed, strong winds buffeted our home, but thoughts of the coming day’s traverse to C-18 and adding new points to my life’s map lulled me to sleep. Matt Pickart, Lindsey Nicholson and Jon Doty watching the sunset with Devil’s Paw in the background. Photo by Salvador G. Candella.